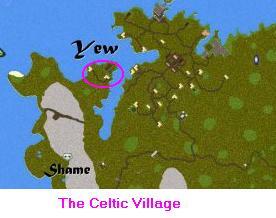 Last visited by Zerver on Mar 15 99The Celtic Village is located near Shame Mountain in the far west area of Yew. It is across the bay from the main portion of Yew city, but it still has a guard protection area and 2 NPC houses that have been fixed up nicely for them. They also have a couple of the fields fenced in to allow livestock to be gathered and raised.